After several decades in which it became a prime target for critique, universalism remains one of the most important issues in social and political thought. Daniel Chernilo reassesses social theory's universalistic orientation and explains its origins in natural law theory, using an impressive array of classical and contemporary sources that include, among others, Habermas, Leo Strauss, Weber, Marx, Hegel, Rousseau and Hobbes. 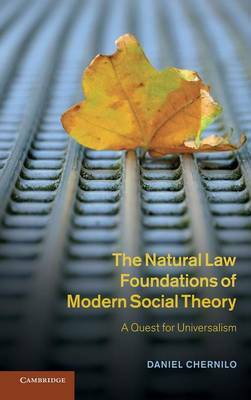 The Natural Law Foundations of Modern Social Theory challenges previous accounts of the rise of social theory, recovers a strong idea of humanity, and revisits conventional arguments on sociology's relationship to modernity, the enlightenment and natural law. It reconnects social theory to its scientific and philosophical roots, its descriptive and normative tasks and its historical and systematic planes. Chernilo's defense of universalism for contemporary social theory will surely engage students of sociology, political theory and moral philosophy alike.